The H.264 / AVC standard specifies two types of entropy coding: Context-based Adaptive Binary Arithmetic Coding (CABAC) and Variable-Length Coding (VLC). The Variable-Length Coding scheme is described in this document. Parameters that require to be encoded and transmitted include the following (Table 21). Above the slice layer, syntax elements are encoded as fixed- or variable-length binary codes. At the slice layer and below, elements are coded using either variable-length codes (VLCs) or context-adaptive arithmetic coding (CABAC) depending on the entropy encoding mode. When entropy_coding_mode is set to 0, residual block data is coded using a context-adaptive variable length coding (CAVLC) scheme and other variable-length coded units are coded using Exp-Golomb codes. where INFO is an M-bit field carrying information. The first codeword has no leading zero or trailing INFO; codewords 1 and 2 have a single-bit INFO field; codewords 3-6 have a 2-bit INFO field; and so on. 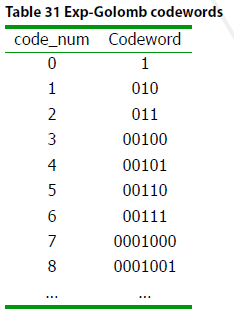 The length of each codeword is (2M+1) bits. Read in M leading zeros followed by 1. (For codeword 0, INFO and M are zero). ue(v) : Unsigned direct mapping, code_num = v. Used for macroblock type, reference frame index and others. code_num as follows (Table 32).  me(v) : Mapped symbols; parameter v is mapped to code_num according to a table specified in the standard. This mapping is used for the coded_block_pattern parameter. 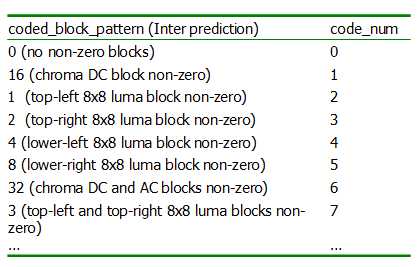 Table 33 lists a small part of the table for Inter predicted macroblocks: coded_block_pattern indicates which 8x8 blocks in a macroblock contain non-zero coeﬃcients. After prediction, transformation and quantization, blocks are typically sparse (containing mostly zeros). CAVLC uses run-level coding to compactly represent strings of zeros. The highest non-zero coeﬃcients after the zig-zag scan are often sequences of +/-1. CAVLC signals the number of high-frequency +/-1 coeﬃcients (“Trailing 1s” or “T1s”) in a compact way. The number of non-zero coeﬃcients in neighbouring blocks is correlated. The number of coeﬃcients is encoded using a look-up table; the choice of look-up table depends on the number of non-zero coeﬃcients in neighbouring blocks. The level (magnitude) of non-zero coeﬃcients tends to be higher at the start of the reordered array (near the DC coeﬃcient) and lower towards the higher frequencies. CAVLC takes advantage of this by adapting the choice of VLC look-up table for the “level” parameter depending on recently-coded level magnitudes. CAVLC encoding of a block of transform coeﬃcients proceeds as follows. 1. Encode the number of coeﬃcients and trailing ones (coeﬀ_token). The first VLC, coeﬀ_token, encodes both the total number of non-zero coeﬃcients (TotalCoeﬀs) and the number of trailing +/-1 values (T1). TotalCoeﬀs can be anything from 0 (no coeﬃcients in the 4x4 block)1 to 16 (16 non-zero coeﬃcients). T1 can be anything from 0 to 3; if there are more than 3 trailing +/-1s, only the last 3 are treated as “special cases” and any others are coded as normal coeﬃcients. If only block U is available, N=NU ; if only block L is available, N=NL ; if neither is available, N=0. N selects the look-up table (Table 34) and in this way the choice of VLC adapts depending on the number of coded coeﬃcients in neighbouring blocks (context adaptive). Num-VLC0 is “biased” towards small numbers of coeﬃcients; low values of TotalCoeﬀs (0 and 1) are assigned particularly short codes and high values of TotalCoeﬀ particularly long codes. Num-VLC1 is biased towards medium numbers of coeﬃcients (TotalCoeﬀ values around 2-4 are assigned relatively short codes), Num-VLC2 is biased towards higher numbers of coeﬃcients and FLC assigns a fixed 6-bit code to every value of TotalCoeﬀ. often and is assigned the shortest VLC. 2. Encode the sign of each T1. For each T1 (trailing +/-1) signalled by coeﬀ_token, a single bit encodes the sign (0=+, 1=-). These are encoded in reverse order, starting with the highest-frequency T1. 3. Encode the levels of the remaining non-zero coeﬃcients. (a) Initialise the table to Level_VLC0 (unless there are more than 10 non-zero coeﬃcients and less than 3 trailing ones, in which case start with Level_VLC1). (b) ) Encode the highest-frequency non zero coeﬃcient. (c) If the magnitude of this coeﬃcient is larger than a pre-defined threshold, move up to the next VLC table. In this way, the choice of level is matched to the magnitude of the recently-encoded coeﬃcients. 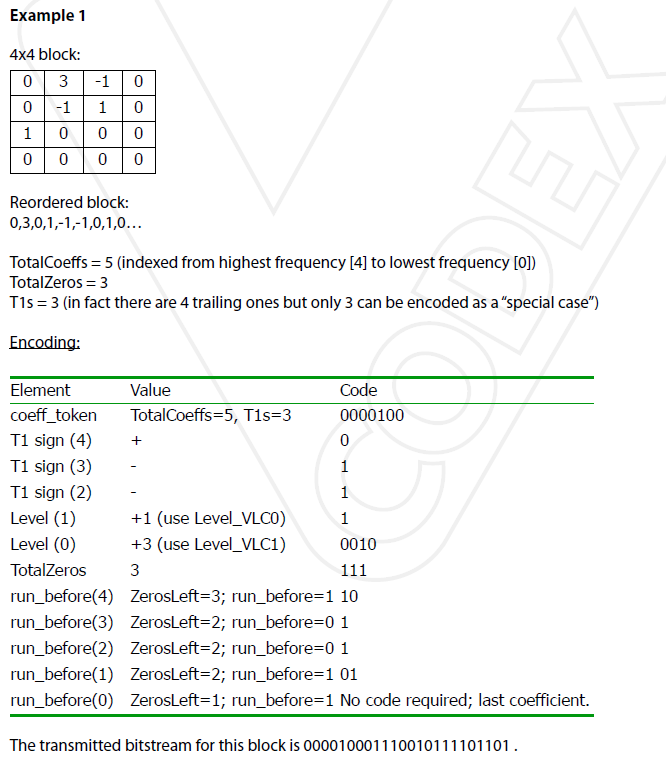 The thresholds are listed in Table 35; the first threshold is zero which means that the table is always incremented after the first coeﬃcient level has been encoded. 4. 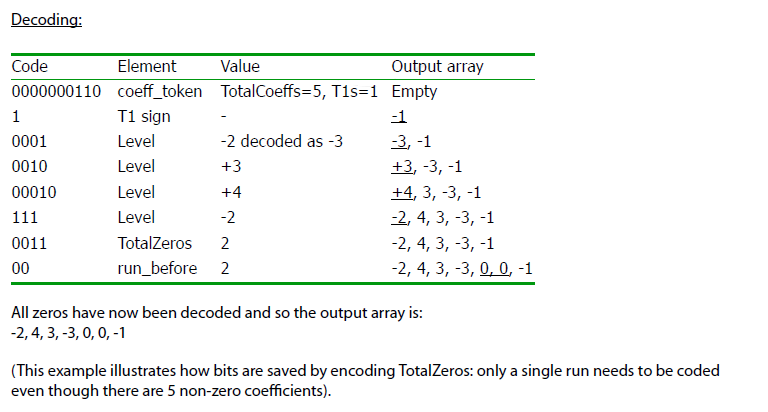 Encode the total number of zeros before the last coeﬃcient. TotalZeros is the sum of all zeros preceding the highest non-zero coeﬃcient in the reordered array. This is coded with a VLC. 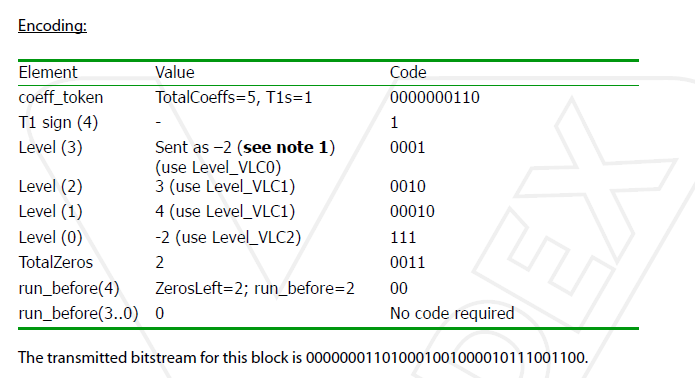 The reason for sending a separate VLC t indicate TotalZeros is that many blocks contain a number of non-zero coeﬃcients at the start of the array and (as will be seen later) this approach means that zero-runs at the start of the array need not be encoded. 5. Encode each run of zeros. (a) If there are no more zeros left to encode (i.e. ∑[run_before] = TotalZeros), it is not necessary to encode any more run_before values. (b) It is not necessary to encode run_before for the final (lowest frequency) non-zero coeﬃcient. The VLC for each run of zeros is chosen depending on (a) the number of zeros that have not yet been encoded (ZerosLeft) and (b) run_before. For example, if there are only 2 zeros left to encode, run_before can only take 3 values (0,1 or 2) and so the VLC need not be more than 2 bits long; if there are 6 zeros still to encode then run_before can take 7 values (0 to 6) and the VLC table needs to be correspondingly larger. In all the following examples, we assume that table Num-VLC0 is used to encode coeﬀ_token. 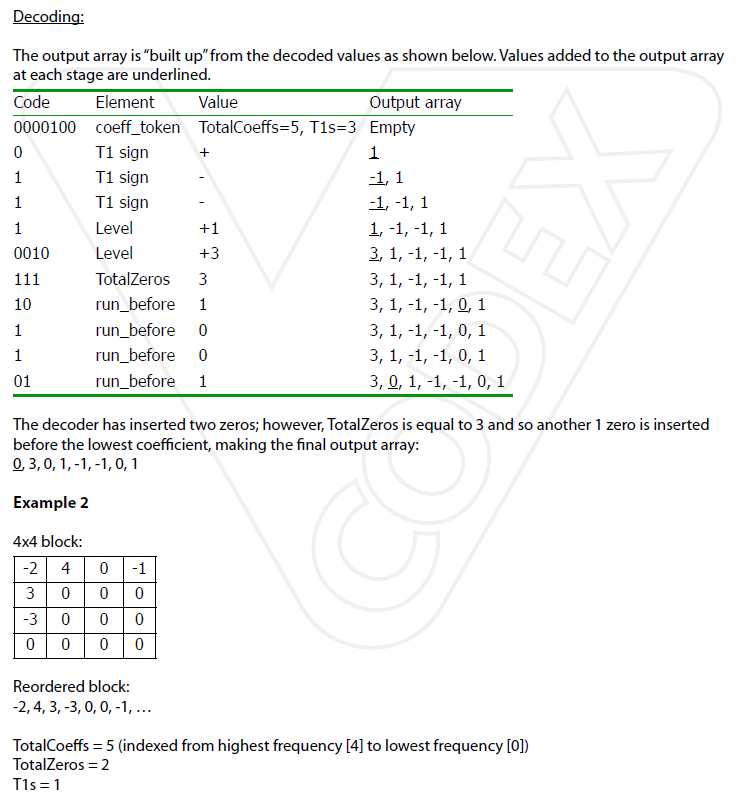 The output array is “built up” from the decoded values as shown below. Values added to the output array at each stage are underlined. Note 1: Level (3), with a value of -3, is encoded as a special case. If there are less than 3 T1s, then the first non-T1 level will not have a value of +/-1 (otherwise it would have been encoded as a T1). To save bits, this level is incremented if negative (decremented if positive) so that +/-2 maps to +/-1, +/-3 maps to +/-2, and so on. In this way, shorter VLCs are used. Note 2: After encoding level (3), the level_VLC table is incremented because the magnitude of this level is greater than the first threshold (which is 0). After encoding level (1), with a magnitude of 4, the table number is incremented again because level (1) is greater than the second threshold (which is 3). Note that the final level (-2) uses a diﬀerent code from the first encoded level (also –2).